Any aesthetic defects are not to be considered defects, but qualities that demonstrate the naturalness of the crops. Our plants of Aloe Vera (botanical name: Aloe Barbadensis miller) are kept in the open air with a solar exposure of about 60%. Once you receive the plant, you should not put it immediately under full sun exposure, rather do it gradually. Aloe needs little water. It should be watered every 3/7/15/30 days depending on the time of the year (little or nothing in winter, more often in the summer). As for the compost, which is essential if the plant is kept in a vase, in the spring/summer period, it is recommended to use organic fertilizer to be diluted with water every 30 days. If you plant the Aloe in the ground, if the soil is tilled, the plant does not need special compost. For the harvest of Aloe Vera leaves we start from the largest branch from the bottom to the top and tear slightly and then rotate in a circular way around the plants. Do not water the leaves before 7/10 days from harvest and do not water the plant for 7/10 days before harvest. 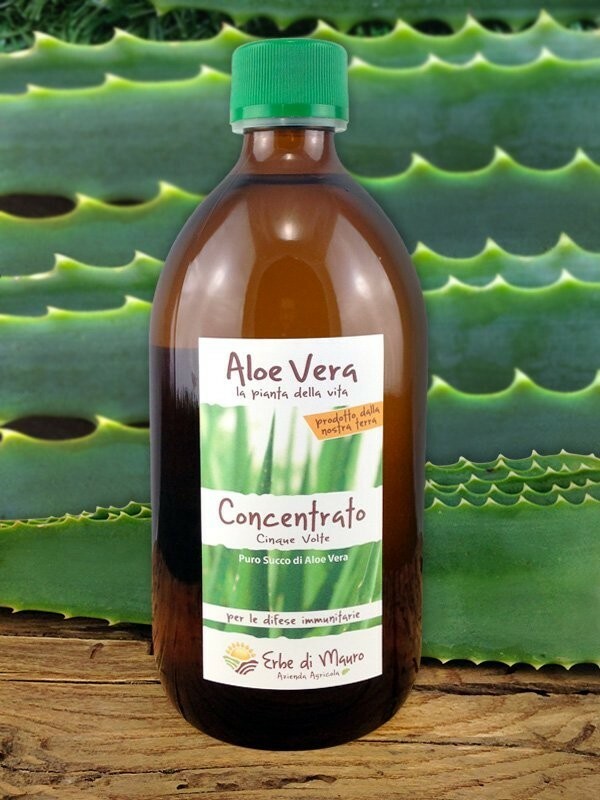 If you want, you can plant Aloe Vera in the ground during the period between April and July, creating a bit of shade on the plant in the first weeks to make the plant gradually adapt to the ground without stress. The Aloe Vera plant does not withstand temperatures below 0 °, if the plant is in the garden or outdoor it is necessary to cover it with appropriate cloths or to move it inside the house in colder periods. If you want to move it in the sun, it is better to do it gradually: doing so you avoid damaging the leaves and you will get a splendid ornamental plant, also ideal for the preparation of juices.